Norovirus infections are on the rise in the U.S. and around the world right now. Sometimes called stomach flu or “winter vomiting,” norovirus infections cause vomiting, diarrhea and stomach cramps. The sickness can last from one to three days. Norovirus spreads when people come in contact with surfaces or eat food contaminated with bodily fluids from a sick person. The virus is very contagious, and an infected person can pass it on even before they start feeling sick and for up to three days after they feel better. The virus spreads quickly in places where people live or play closely together: day care centers, schools, nursing homes, hotels and cruise ships. 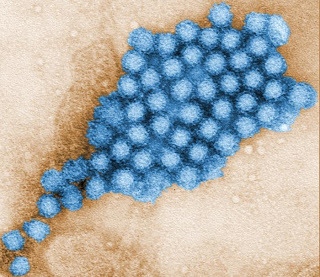 The norovirus is more active in cold weather, so cases usually peak during the colder months, but some officials are saying that cases are higher than ever this season. Outbreaks have been reported in California, Oregon, Georgia, Maine, West Virginia and on several cruise ships. More than 1 million people are thought to have been infected in the U.K. this winter — 72 percent more cases than last year. The most common way that norovirus spreads is through food that has been handled by an infected person. The U.S. Centers for Disease Control and Prevention reports that 50 percent of food-related illness each year is caused by norovirus contamination. Wash your hands with soap and water. You should wash your hands for at least 20 seconds with hot, soapy water. This is especially important to do before and after you eat or prepare food, after using the restroom and when taking care of someone who is sick. We have great fact sheets to help hand-washers of all ages. Don’t make food for other people if you are sick. Wash fruits and vegetables well and cook seafood thoroughly. If you or a loved one gets sick, make sure to wash clothes, sheets and towels in hot water. We hope that these tips help you stay infection-free this winter! 2013 Get Ready Scholarship opens Feb. 4!